LeanIn.org and McKinsey and Company partnered to do an in-depth study on women in the workplace. They polled 118 workplaces, and 30,000 employees. Most of the findings weren’t surprising. “Women are still underrepresented at every level in the corporate pipeline.” Newsflash. Still, some assumptions about why this happens may have been shattered with today’s study release. vice is useful (enough to inspire me to attend grad school), it lets our culture off the hook. But according to this study, we’re not leaning back as much as people assume we are. In fact, we’re leaning back less often than men. Men are more likely than women to site “Family Responsibilities” as their reason for not wanting to advance to the top executive level. This flies in the face of the assumption that women are holding themselves back because they want to ensure they have time for an eventual family. 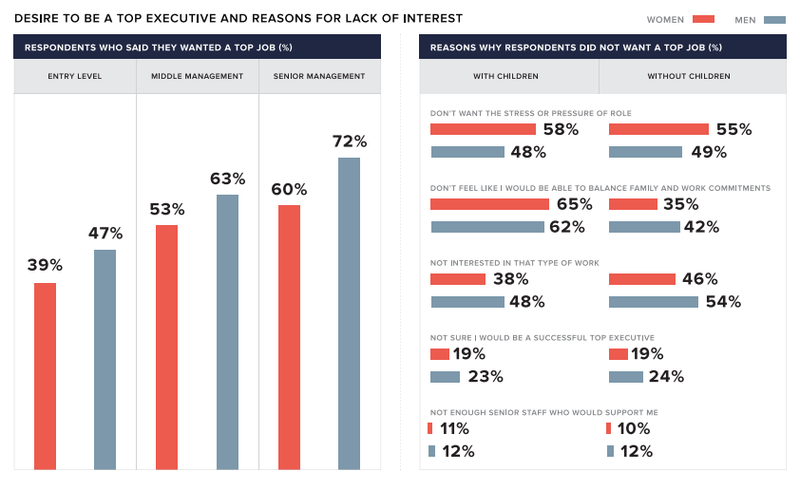 Overall, women are most likely to site “stress/pressure” as their top reason for not wanting a top job. Black, Hispanic, and Asian women are more interested in being promoted than white employees of both genders. This isn’t surprising, but worthy of a mention for women minorities who face a double-whammy. According to the study, Black, Hispanic, and Asian women are 43 percent more interested in becoming a top executive than white women and 16 percent more interested than white men. Something else is clearly holding them back. Men don’t think there’s a problem. 88% of men think women have the same or better opportunities for advancement as men, compared to only 57% of women. 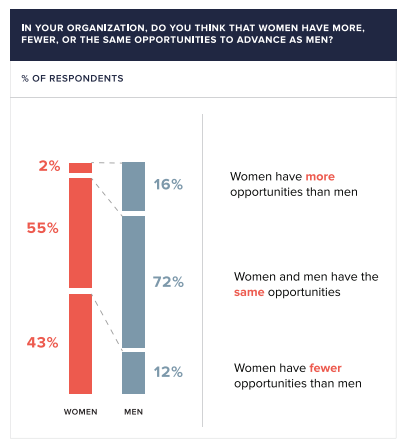 An adorable 16% of men think women have more opportunities than men. If you’re one of those 16%, call me. I want to work for your company. But 70% think gender diversity is important. This means is that men are paying lip service to the idea of diversity, with little understanding of the challenges women face. Kudos for having our backs, fellas, can you maybe be a better noticer? Working women still do more in the home than their male partners, and it’s not getting better with passing generations. “At every level, women are at least nine times more likely than men to say that they do more child care and at least four times more likely to say they do more chores. Even in households where both partners work full-time, 41 percent of women report doing more child care and 30 percent report doing more chores.” Pull yourselves together, men! Once again, minorities struggle more. Only half of Black women say they have received senior-level support in advancing their career, compared with about two-thirds of white, Asian, and Hispanic women. 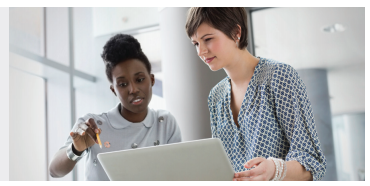 Luckily, the report contains a call to action, with 5 key steps toward more gender equality. The entire report is worth a read, so check it out for more info. Men and women can only benefit from this knowledge. Excuse me, I’m going to go slip it under a few peoples’ doors now. Melissa Dylan is a writer and MBA who thinks 16% of men need a stern talking-to. ← What’s the deal with GE moving to Canada and that Ex-Im Bank Thingy?